Search "sculpture" 25 results have been found. 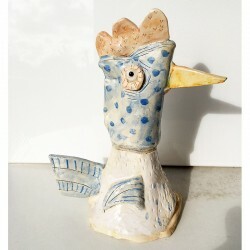 Sculpture: "Chicken with Blue Polka Dots"
Only one available - one of a kind.Hand sculpted, painted and kiln fired glazed clay ceramic. Height: 23 cm / 9 inchesWidth: 22 cm / 8.6 inchesWeight:1 lb. We ship worldwide.Shipping costs here. Only one available - one of a kind. Hand sculpted, painted and kiln fired glazed clay ceramic. Dimensions:Height: 21 cm / 8.3 inchesWidth: 21 cm / 8.3 inchesDepth: 5 cm / 2 inchesWeight:0.5 kilograms / 1 lbs. We ship worldwide.Shipping costs here. Only one available - one of a kind.Hand sculpted, painted and kiln fired glazed clay ceramic. Height: 17.5 cm / 6.9 inchesWidth: 27 cm / 10.6 inchesWeight:1 lb. We ship worldwide.Shipping costs here. 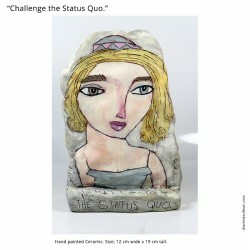 Sculpture: "Challenge the Status Quo"
Only one available - one of a kind.Hand sculpted, painted and kiln fired glazed clay ceramic. Height: 15 cm / 5.9 inches.Width: 12 cm / 4.7 inches.Weight:1 lb. We ship worldwide.Shipping costs here. 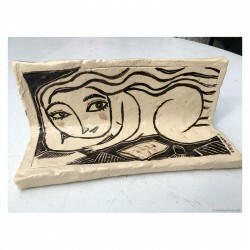 Sculpture: "Woman with Long Hair"
Only one available - one of a kind. I used a special ceramic pencil to draw the woman on the sculpted clay. Hand sculpted, painted and kiln fired glazed clay ceramic. Height: 22.5 cm / 8.5 inches.Width: 8 cm / 3 inches.Weight:1 lb. We ship worldwide.Shipping costs here. 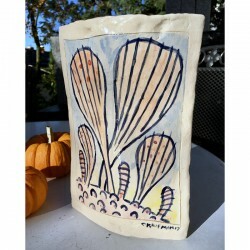 Only one available - one of a kind.Hand sculpted, painted and kiln fired glazed clay ceramic. Height: 22 cm / 8.6 inches.Width: 15 cm / 5.9 inches.Weight:1 lb. We ship worldwide.Shipping costs here. SOLD. 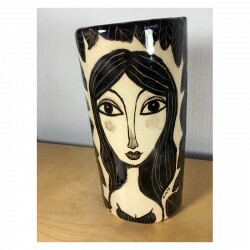 Only one available - one of a kind.Hand sculpted, painted and kiln fired glazed clay ceramic. Width: 28 cm / 11 inches.Height: 22 cm / 8.6 inches.Weight:1 lb. We ship worldwide.Shipping costs here. SOLD. 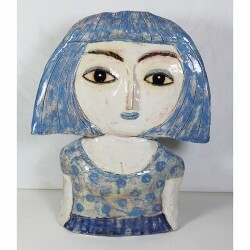 Only one available - one of a kind.Hand sculpted, painted and kiln fired glazed clay ceramic. Height: 28 cm / 11 inches.Width: 22 cm / 8.6 inches.Weight:1 lb. We ship worldwide.Shipping costs here. Only one available - one of a kind.Hand sculpted, painted and kiln fired glazed clay ceramic. Height: 24 cm / 9.4 inches.Width: 12 cm / 4.7 inches.Weight:1 lb. We ship worldwide.Shipping costs here. 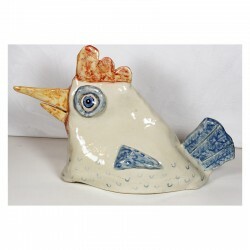 Only one available - one of a kind.Hand sculpted, painted and kiln fired glazed clay ceramic. Height: 28 cm / 11 inches.Width: 24 cm / 8.6 inches.Weight:2 lb. We ship worldwide.Shipping costs here. Sculpture: "Three Women in a Bathtub"
SOLD.Only one available - one of a kind.Hand sculpted, painted and kiln fired glazed clay ceramic. Height: 28 cm / 11 inches.Width: 22 cm / 8.6 inches.Weight:1 lb. We ship worldwide.Shipping costs here. 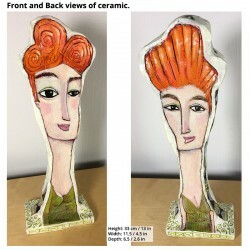 Sculpture: "Women with Orange Hair"
SOLDOnly one available - one of a kind. 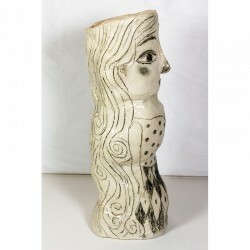 Women carved on both sides of kiln-fired ceramic sculpture. Painted with acrylic paints & 3 coats of varnish.Height: 33 cm / 13 in Width: 11.5 / 4.5 in Depth: 6.5 / 2.6 in Weight:1 lb. We ship worldwide.Shipping costs here.